The 90’s hit song that took away our breathes to the melody of love, ‘Dheere Dheere’ from the film Aashiqui, is now driving us to a tour that is finely garnered with trend, fashion and of course the glitter of love with the recreation from Yo Yo Honey Singh. Featuring Sonam Kapoor and Hrithik Roshan, the melody has now become buzz in the internet with more than five million views and is aww-inspiring when it comes to cuteness loaded by the fresh pair and the way it has been created. Look at Sonam throughout the video and go get a way to learn some fashion lessons that are easy to adopt and simple to embrace with. 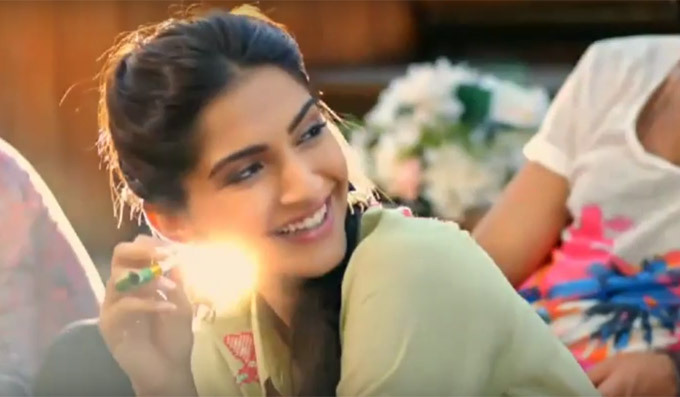 In this music video, from the beginning itself the air is all clear with the magic filled by fashion as Sonam appears in a printed silk midi which she pairs up with a green embroidered shirt and a pair of camel earring. This chic look works great on working women those who want to rule their fashion with fringes. If there is a doubt about how to mix and match a striped top with a floral printed skirt, ask the 30 year old fashionista how to make it work. Next to these pretty looks is prettiest and many girls favorite – the perfect combination of pastels. The elegance of pastels comes out totally with the choice of pairing and Sonam won in the game of tying a pure knot of fashion by selecting a pastel brick red colored crop top and a sky blue skirt. For the total diva effect, get a pair of big earrings and aesthetic adding pair of footwear. The fashion flow doesn’t appears to stop despite the music video get closes to ‘the end’ bar as we find the Khoobsurat girl in a white strapless bridal wear that is totally fit and gorgeous on her.